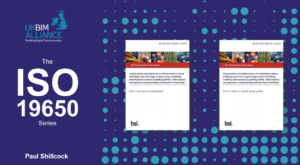 A new ISO 19650 video series has been produced by The UK BIM Alliance. The Alliance represent and works with and for the built industry. Helping to facilitating the drive to digitally transform the industry through education, leadership and focus. In an industry of over 4M people, where 95% work in SMEs, or micro-SMEs, their mission is to ensure that we all understand the value of a digital enabled industry. Because the UK BIM Alliance aims to ensure BIM becomes business as usual whilst at the same time, transforming and future proofing the way the industry work. Above all, with this new video series, they show you the key elements of the new ISO 19650 series of standards. You can see the first three ISO 19650 Video’s on the UK BIM Alliance youtube channel. Paul Shillcock kicks off with the first video: An Introduction to ISO 19650. Paul is the author of ISO 196502 and the UK National Annex, also the co-author of PAS 1192-2 and the UK transition guidance PD 19650-0. He starts with some background on how the new standards came about, the development process and what it means for those of you who have already aligned your business processes to the 1192 series. 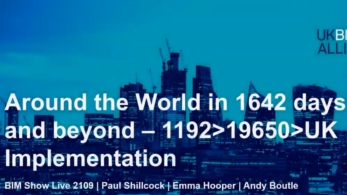 Paul is joined by Emma Hooper, who looks at key changes from the 1192 series and Andy Boutle finishes the last of the video’s by highlighting the guidance and support available for organizations that are wishing to adopt the ISO 19650 series. Starting at the natural point of what exactly ISO 19650 is Paul Shillcock outlines the foundations of ISO 19650. Along with their relationships with the BS 1192 series and how the standards have developed over the last few years. ISO 19650-1 covers the concepts and principles for the management of information throughout the asset life cycle. ISO 19650-2 focuses on the management of information during the delivery phase of assets. You can view ISO 19650 Video part 1 here. 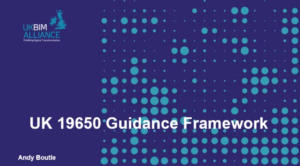 Emma shows how organizations can use PD 19650-0 transitional guidance (part 1) which points out the main changes and differences in the standards. Because later this year phase 2 guidance will be available for organizations. Because within the new series of standards some of the terminology you may have got used to has changed in the new international standards. You can view ISO 19650 Video part 2 here. In this last video Andy Boutle explains that lessons have been learnt from BS 1192 and PAS 1192-2 release. Back then, there were numerous guidance notes from differing bodies and individuals. Therefore, UK BIM Alliance, BSI and Centre for Digitally Built Britain will publish one set of guidance. Therefore, taking a co-ordinated approach to creating and communicating a single set of guidance in a clear and concise manner to support industry understanding. Above all, message how organizations can make the shift from UK 1192 to ISO 19650 series without confusion. You can view ISO 19650 Video part 3 here. There is another video here from the BSI. 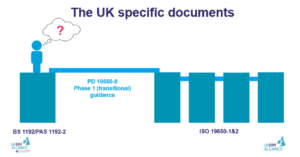 In this video, Dr Anne Kemp, David Churcher and Paul Shillcock go through the new ISO 19650. Answering questions surrounding the new transition from BS 1192 and PAS 1192-2 to ISO 19650 international standards. Therefore, the challenge is to now education workforce’s. Discover how you can educate your workforce to the new ISO 19650 series visit Operam Academy.